AwF has been established for the specific purpose of promoting and supporting responsible and sustainable aquaculture to assist in poverty alleviation through improving rural livelihoods in developing and transition countries. In its work, AwF draws on the experience of respected professionals from every relevant discipline. AwF is unique in devoting all of its resources and attention to aquaculture; however, it does not seek to promote aquaculture in isolation, but as a component of integrated rural and coastal development plans, and of strategies to alleviate poverty. This website is the home of the UK based Aquaculture without Frontiers (AwF). There are a number of AwF’s in existence and each organisation is independent but operating under the common banner and aims of the charities original founder and our UK charity’s Patron, Mr. Michael New O.B.E. Additional to the UK there are currently AwF’s based in the USA, Australia and South America. Aquaculture without Frontiers is now in its second year of operation since its re-establishment as a Charities Commission registered organisation in the UK. In its first year the AwF UK charity obtained a pledge of support for a Vietnamese feed nutritionist to travel to Thailand to attend an aqua feed training course kindly sponsored by Progressus AgriSchools. Cross section of Farmers at the AwF (UK), Nigeria meeting. The charity also investigated constructing a smallholder project in Nigeria with tri-partite legal documentation between the charity, feed companies and an in-country African smallholders farmers group. This project is to be a support program in the form of small micro-loans for existing farmers in the aquaculture trade in Nigeria. The plan has been presented to the Nigerian group and all liked the principle of this direct contact of AwF with the farmers themselves and they have all expressed optimism about the success of the potential program. Through these discussions news of the potential program has been disseminated and a meeting has been held at Godo blocks guest house, Badagry, Lagos State Nigeria involving a total of 62 farmers from different areas in attendance. Some of the issues discussed were; conditions for being a beneficiary of the potential program, nature of the support, duration and other related matters. Farmers were made to understand that the AwF support is not free money and it will come within a clearly defined programme. It was also explained that the support comes only in the form of direct inputs and supplies together with training, counselling, consultancy and management support. The group understand that it will be required to strongly self-police against non-genuine intentions in order to avoid damaging the whole program. i.e. if one smallholder farmer defaults the next one in line misses out. Key people in the community have been chosen in the interim to lead and pilot the affairs of the group and traditionally micro-loans have record low levels of default. The news of this potential support has already significantly motivated farmers and some have already speculatively constructed a hatchery for the production of fish seeds in preparation for the potential program. Clearly some people will be sceptical about the success of the program given historical examples of government programs that have not prospered in the past. However the majority of the smallholder community in the region are very optimistic and certain of success because in our case there is no political element to the program and most importantly there is direct contact between the providers and the beneficiaries. we are building a project to support smallholder fish farmers at Cape Maclear, or Chembe, a town on Malawi’s Nankumba Peninsula, at the southern end of Lake Malawi. Aquaculture without Frontiers UK has joined Charity Checkout to manage donations so that donors can select specific projects to support. 2. Support funding for the training of feed producers in formulating and manufacturing fish feeds by feed manufacturers operating in developing and transitional countries. This is an opportunity for everyone within the aquaculture industry who recognises the importance of aquaculture in feeding a growing world population, to support fellow fish farmers in transitional countries who are having to cope with difficult conditions - financial, technological and climatic - within their country, region and/or community. Every contribution no matter how small it is important that it is spent in the right way. AwF UK has the connections to bring this about. The UK based AwF undertakes to spend all donations received on charitable projects without the deduction of administration costs for such items as office, travel and stay for trustees promoting the charity. These administration costs will be covered by subscription or through separate sponsorship. Thus donors can select a specific project of the UK based AwF that you wish to donate to in complete confidence that the full amount of your donation will be spent on that chosen activity. 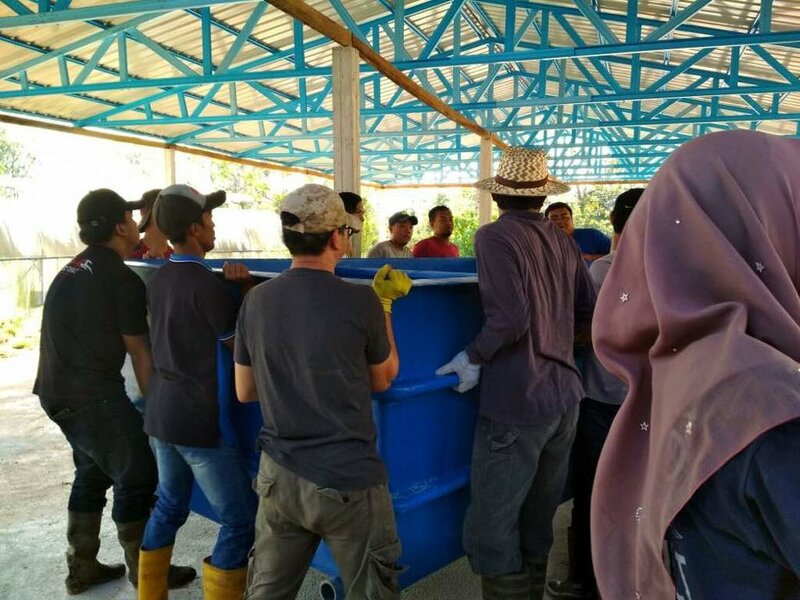 The Universiti Malaysia Perlis (UniMAP) has established an ‘aquaculture incubator’ using a simple recirculating aquaculture system (RAS) developed jointly with a private company. The incubator aims to train students to be aquaculture techno-entrepreneurs or ‘Aquapreneurs’ of the future. 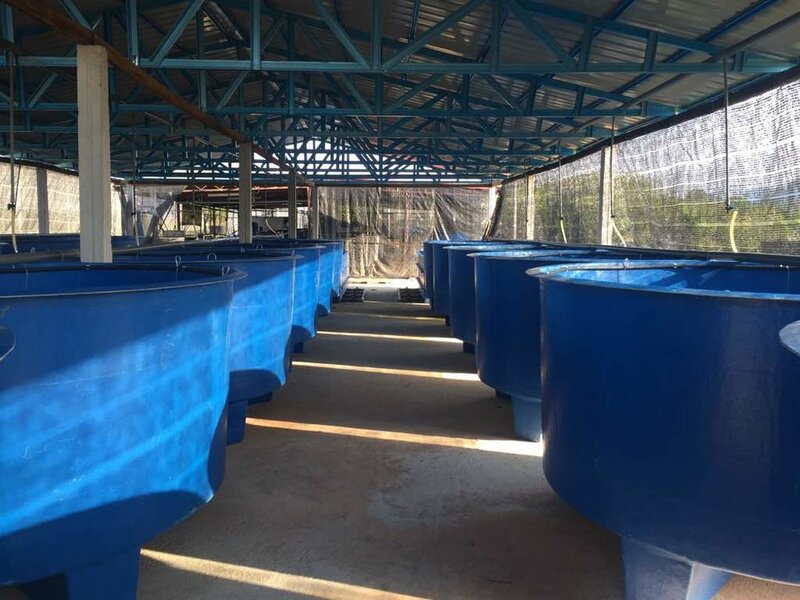 It is also a platform for aquaculture technology related research and development, and for show-casing sustainable fish production using simple, affordable, user- and environmental-friendly, cost-effective systems. The RAS has proven ideal for commercial rearing of Jade Perch (Scortum barcoo) and Tilapia (Oreochromis niloticus). In January 2018, 14 UniMAP undergraduate students, whose parents are in B40 (that is, the bottom 40 percent of households) with monthly income of less than RM3900 per month - less than US$1000/month) were selected to participate in a Student Social Entrepreneurship Program. Their selection was based on certain criteria such as parents’ or household income, family background, as well as their interest and determination to learn about entrepreneurship, aquaculture systems, fish production and willingness to devote their free time after class and during holidays to work at the on campus incubator fish farm. Student trainees - in between their classes, lectures and laboratory activities - must spend over a period of six to seven months working and learning about the principles of RAS, design and assembly, its standard operating procedures (SOP) and basic fish biology, feed and nutrition, fish health, behaviour, fish husbandry, entrepreneurial skills and leadership skills. “We are looking to raise ‘pocket money’ for these student so they can cover their food expenses while working through the initial first cycle until their first harvest is sold into the local market,” says AwF UK CIO Chairman Cliff Spencer. Anticipated net income from the sale of Jade Perch (total income less operational expenses such as costs of fry, feed, electricity, water and other consumables), partly becomes earning for trainees and partly as reserves for system maintenance, upgrading or acquisition of new system such as farm expansion. Please support this project HERE or by clicking the special button below. Your donation will go directly to this project and you can follow the student’s progress on this page as they work through the first cycle of Jade Perch production in an RAS. “We welcome contributions, in cash or in kind, which are likely useful in offsetting the operational cost of fish rearing, or simultaneously as partial advance payment of their monthly allowance which they can use to buy decent meals or pay for other unexpected miscellaneous expenses,” says Professor Ridzwan who is overseeing the project at the Universiti of Malaysia Perlis. The proposed incubator programme is just a small step which UniMAP can contribute towards improving aquaculture and the quality of life of Malaysians as pledged in the TN50 (National Transformation 2050) and the United Nation Sustainable Development Goals agenda, he adds. “The need for farmed fish and shellfish production in marine and freshwater environments has never been greater. The oceans will yield no more in wild capture yet global demand inexorably rises as population increases. At the same time the need for the best nutrition for children that fish affords has never been greater or better understood. AwF will work to establish sustainable aquaculture around the globe for the benefit of those most in need." The deputy-Chairman of the Aquaculture without Frontiers (UK) CIO, Roger Gilbert, who is also the publisher of International Aquafeed magazine, was invited to provide a keynote address to the 2nd National Aquaculture Seminar ‘Unity in Diversity’ during the Philippines three-day Aquaculture conference between May 23-26, 2017 in Manila, Philippines. “We had held a successful aquaculture conference for 550 delegates in Saigon, Vietnam in October 2016 and The Philippines wanted to emulate that in Manila this year. The local industry attracted over 700-attendees and it was an honour to be asked to make an opening address on trends in aquaculture and feed production,” says Mr Gilbert. He not only outlined the current world aquaculture situation and some key trends in equipment and technology, he focused on the need to alert governments and consumers alike about the need for a greater attention to be paid to the production of scientifically-formulated compound feed. “we have 7.3 billion people on our planet today and we produce just over one billion tonnes of compound feeding stuffs, including 40 million tonnes of aqua feeds. Mr Gilbert says the established aquaculture industry has an obligation to support their counterparts, namely fish farmers, in transitional countries in overcoming barriers to growth. Ensuring the highest quality feeding stuffs are available is a prerequisite to that production.